In a Nutshell: A lot of questions come up when you’re applying to college: Where should I apply? How do I get in? Which is the best way to afford my education? I’m accepted, now what? As a brand, Edvisors operates a suite of sites specializing in various aspects of getting into and paying for college. The Edvisors sites aim to answer your college questions, from offering guidance on filing your Free Application for Federal Student Aid (FAFSA) to scholarship matching and loan comparison, plus tip sheets and advice for students. Edvisors.com specifically offers tools, such as an interactive Student Survival Guide and an annually updated e-book, Filing the FAFSA, to help both parents and students prepare for college and its costs. You’ve written your essays, submitted your applications, and been admitted, but how are you going to pay for college? There was no way I could have gone to the state university of my choice without a scholarship. During my senior year of high school, I applied to the top two public universities in the state as well as the local university that was a reasonable commute from my parent’s house. Honestly, the only reason I was able to go to the school of my choice (a good two hours from mom and dad) was because in Florida we had a great state scholarship program that was fairly easy to qualify for. However, that academic merit-based program, Bright Futures, was the only scholarship I applied for because I wasn’t aware of my other options. I didn’t know what I wanted to do yet going into college, so I couldn’t apply for the major-specific scholarships I had heard of before. I didn’t play sports in high school, so a talent-based scholarship was also out of the question. The best I could do, which I did, was qualify for Bright Futures based on my grades and fill out the Free Application for Federal Student Aid (FAFSA) to see if I could get additional funding. Edvisors updates Filing the FAFSA annually to reflect any changes in the rules and process. But even the FAFSA wasn’t exactly easy to fill out. I needed a lot of information from my parents to complete it, including income and asset information, which got a little confusing since, at the time, one parent was self-employed and the other recently laid off. FAFSA uses the tax information from the previous year (see below for changes to the 2017-2018 academic year) to calculate how much students and their parents, if applicable, can contribute to pay for college, so in my situation the tax information was inaccurate. If your FAFSA results deem your family has enough income to cover the costs of your education, you may only qualify for loans rather than scholarships or grants (luckily, I also qualified for a few grants, which don’t have to be repaid, unlike loans). I only know all of this now because I had to go into office after office, make phone call after phone call, and Google everything to learn about my options. When we spoke with Anita Myles and David Levy, they told us how they’re hoping to make that experience better with their Edvisors online suite of college funding resources. 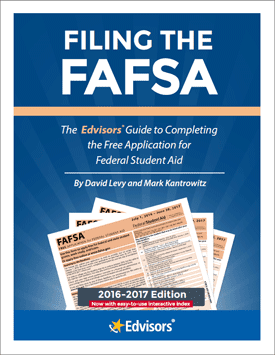 With more than 30 years of experience as the Director of Financial Aid at several top colleges across the country, David had a profound perspective when co-authoring Filing the FAFSA, a 212-page digital book dedicated to all things FAFSA. 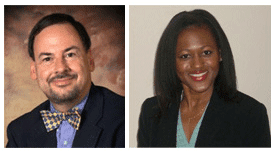 David Levy serves as Editor of Edvisors sites while Anita Myles is the Senior Vice President. “We’ve updated it every year for the last three years,” David says of his book, which is especially relevant as rules and features of the FAFSA change. For example, starting for the 2017-2018 academic school year, the FAFSA will be accepted three months earlier on October 1, which matters for the first-come-first-serve aid available. Additionally, applicants will now be able to use “prior prior year” tax information as part of the recent update for those who have yet to file. The site also offers about two dozen free, downloadable tip sheets on topics such as scholarships, loans, and tax benefits of secondary education, most of which is targeted at parents of college-bound students. 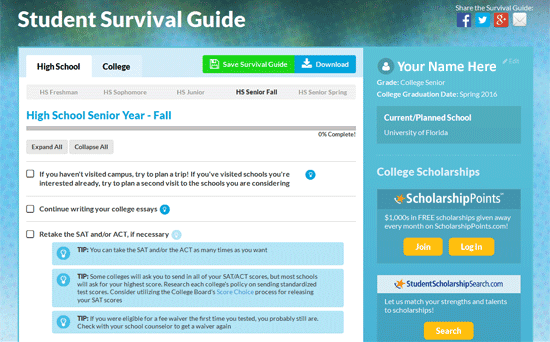 A new, easy-to-use tool was recently added to the resource arsenal of Edvisors.com: the Student Survival Guide. Students create an account to track their path from high school through college graduation. The guide provides a checklist for each year of school, which the senior year of high school split into two halves to ensure all the important details aren’t skipped, with reminders and suggestions for making it successfully across the stage to receive a college diploma. Students can track their progress to college from the Edvisors’ new Student Survival Guide. Within the guide, students can import scholarships they’ve received, and there are even links to calculators for student loan details. Save and download features allow students to access their guide whenever they need it. While you may be advised to do some additional research on your preferred school as you progress through the guide, it helps keep students organized and prepared for the task. David, who serves as the editor for the Edvisors network of sites, explains that the mission of Edvisors as a whole is to help students and parents prepare for college. To that end, Edvisors hosts six different websites, including the main Edvisors.com site, that each cater to the specific needs of students and parents seeking guidance on the application process, funding college, and more. The Edvisors site itself was founded in 1998 and is focused on providing a comprehensive look at FAFSA and funding a college education. Most of the content is geared toward helping parents and students choose the right type of funding — loans, scholarships, work-study programs, or grants secured through the FAFSA. Along with funding information, Edvisors tackles a lot of the “prep” talk for college including checklists and guides that help students get ready for school. One tip sheet even provides insights into what a student might need moving out on their own for the first time such as a coffee maker and a shower caddy. HowToGetIn.com, powered by Edvisors, is geared mostly toward graduating seniors (soon-to-be incoming college freshmen). The site includes month-by-month admissions calendars with application deadlines as well as guides for anyone new to the concept of applying to college. Since 2006, ScholarshipPoints.com has given away more than $750,000 to students using the site to apply for scholarship opportunities. The site allows students to win points for participating in its online community, including answering surveys, playing trivia games, and signing up for free services like Uber. Those points are then used to gain entry into scholarship drawings for sums of $1,000 to $10,500. ScholarshipPoints recently moved to further engage students with the creation of its Campus Life blog, which is written by students, for students, says David. 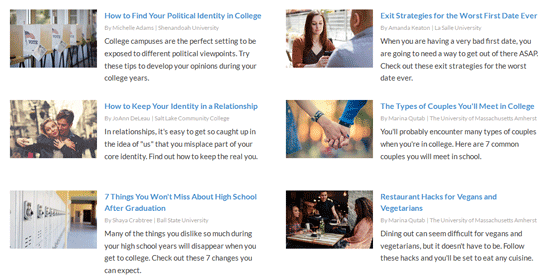 Topics range from dating advice to budgeting tips to studying and shopping hacks, but what’s most helpful about these articles and guides is that they’re coming from students who are currently implementing them. Campus Life, a student-driven blog powered by Edvisors, addresses student life issues and financial topics. StudentScholarshipSearch.com allows students to zero in on the best scholarship opportunities for them based on details like their gender, age, and year in school with its scholarship matching tool. You can even sort by deadline and amount once you’ve completed a search. The search offers traditional scholarships based on academic merit, economic need, or overcoming adversity as well as “weird” scholarships such as the Duck Tape Stuck At Prom Scholarship awarding up to $10,000 to high school students who create and wear their own duct tape fashions to prom. The website PrivateStudentLoans.com answers questions students and parents may have about the loan process. Dedicated specifically to private loans, readers can apply right through the site, which includes a loan comparison tool of the lenders for the student’s school. Both PrivateStudentLoans and StudentLoanConsolidator.com offer resources like the loan payment calculator. However, the written guides on each site vary to the specific site focus — getting a loan or paying it back. For example, PrivateStudentLoans provides details on cosigners, interest rates, and how loans affect credit scores. On the consolidation site, resources include refinancing and deferment advice. My high school had three guidance counselors and one college coordinator for a senior class of 1,200 students, so it’s understandable how students like me could have been left in the dark when preparing for college. As the first in my family to even apply to college, there were a lot of questions my parents and I had about the entire process, including funding my education. If I had known about Edvisors, I’m sure I would have made fewer mistakes along the way, and probably had less stress over paying my way through school. David and Anita say they take pride in the fact that the Edvisors network of websites offer free and accurate resources for every step along the way of the college process — from crossing a high school graduation stage to earning a degree. “Our websites are designed to help students and parents plan and pay for college,” says David. Lauren Keys has a decade of experience in writing and editing for publications including The New York Times, Entrepreneur.com, Gainesville Magazine, and many other media outlets. Known for having a treasure trove of savings tips at the ready, Lauren also regularly helps consumers discover the products and services that can best help them make their money go further. She believes an educated and measured approach is the most-effective route to financial wellness.